In a healthy mouth, the gum tissue fits snugly around the teeth like a cuff. Gum recession is what happens when the gums wear away or pull away from the teeth. Receding gums expose more tooth structure than normal, and if the recession is left untreated, it can eventually expose a tooth’s root. This can lead to painful symptoms and a slew of oral health problems. Here, Drs. Cory and Jennifer Chambers of Cobblestone Park Family Dental share more information about gum recession, including causes, common symptoms and treatment options. Gum recession is a gradual condition, and many people are unaware that they have it. The first sign is often tooth sensitivity or sore gums. You may also notice that your teeth appear longer than before, or the spaces in between the teeth appear wider at the base of the gum line. If you suspect your gums are receding, it is important to schedule a dental appointment so your dentist can evaluate and diagnose the problem. When tooth roots are exposed, they are susceptible to damage from acids, bacteria and aggressive brushing. Exposed tooth roots can eventually become so worn down that they fracture or loosen. This in turn can lead to tooth loss and infection. Treatment depends on the cause and severity of the gum recession. If periodontal disease is the cause, the first step of treatment is typically scaling and root planing. During scaling and root planing, your dentist will remove any tartar and plaque from the teeth and root surfaces. This treatment, along with proper at-home oral hygiene, helps minimize the effects of gum disease, including gum recession. For more advanced stages, a gum graft may be necessary. Gum grafting involves removing a thin piece of gum tissue from another part of the mouth and attaching it where the gum tissue has receded. Gum grafts protect exposed tooth roots from sensitivity and decay. Making changes in regards to your oral health can prevent further damage and gum recession. If your dentist determines your brushing habits are to blame for your gums receding, he or she will give you tips on how to brush properly. Your dentist may also recommend swapping your toothbrush for a soft-bristled brush. 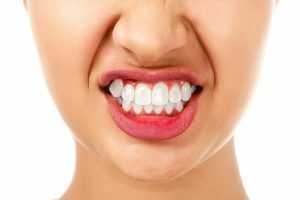 If bruxism is the cause, you may benefit from a custom-made night guard that protects your mouth from the damage and pressure caused by clenching and grinding your teeth. Or, if ill-fitting dentures are to blame, your dentist can make adjustments to your dentures or remake them for you. If you would like to discuss your oral health concerns with Dr. Jennifer or Dr. Cory Chambers, please schedule an appointment with our Oklahoma City office by calling (405) 603-8520 today.